Fall used to mean hunting season in my family. My grandfather started hunting as a boy in Kentucky and must have hunted for 60 or 70 years. After being in Kentucky, I picture him with his brother, bringing home a mess of birds for the family dinner. He taught my father to hunt and my father taught my brother and then my husband who taught my son. Not everyone in the family loved it, but those who did loved it with a passion. It was the whole experience that they loved, I think. They were bird hunters, quail mostly. My grandfather hunted pheasant, too, and my husband and father went on a couple of prairie chicken hunts. My husband hunted duck about once before he gave that up as not the same experience. And dove hunts came later. First, there were the dogs, pointers and setters, smart and loyal to the end. I remember a long line of hunting dogs through my life with short names to call them easily in the fields. Buddy, Guy, Tim, and our favorite name of all, Grandpa. My daddy got Grandpa from a man who had named him that because he thought he acted like an old grandpa. We always delighted in calling “Grandpa” to bring him home. When my husband died, he left me with Tim, the ever loyal and loving English Setter who was his last hunting pal. When I finally felt he needed to be where he could hunt and run, I gave him to one of the men who had hunted with them often. Tim looked at me once before he left that day and then jumped up with his paws on my shoulders to look me in the eye as if to tell me Thank You. It was a moving moment with a sweet dog. 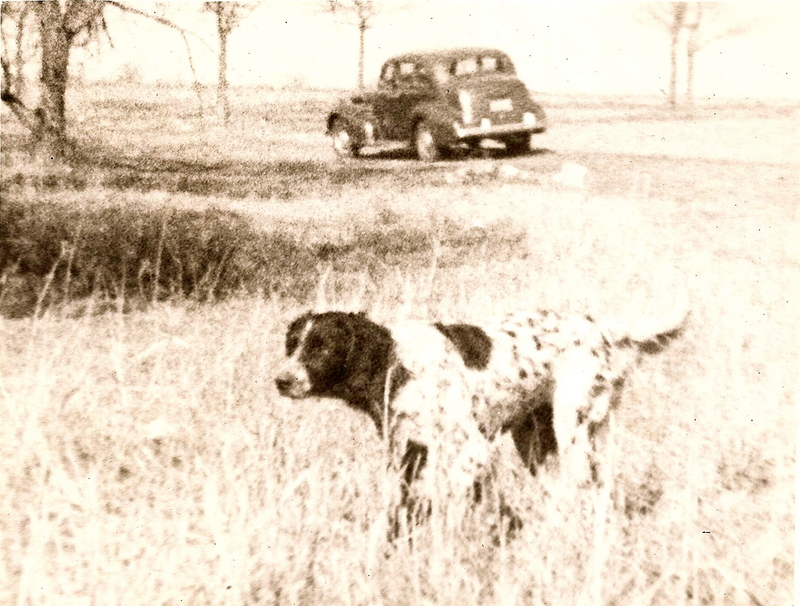 You couldn’t hunt quail very well without the dogs, so they worked with them all the time. Before hunting season even began, there were the days when they just went to run the dogs and get them ready. I think the men just liked to watch them work, running the fields with such abandon, spanning out for a mile and returning quickly at the sound of the whistle. It was all part of the experience. Here’s one that must have belonged to my grandfather, maybe to my father, way back when. Finding a field to hunt was another ritual. My husband spent a lot of time looking for fields that were likely places and checking with the owners to see if it was allowed. For a long time, he and my father had private use of a property about an hour away where they hunted and our family fished the pond. Later, when my father had quit, he hunted with buddies in rural areas in northern Oklahoma. They knew all the hunters in the county and found lots of good places. The night before the hunt was spent on the phone making the arrangements, oiling the gun and boots, packing the vehicle, a pickup in later years, laying out the clothes, the jackets with pockets for shells and game. It was a ritual, part of the deal. I could hear him leave in the morning with his thermos of coffee, the only time he liked to get up early being for a hunt. I could hear him say “Kennel” and the dog would jump into the back of the truck or car, ready to go, tail wagging. Time to drive through the dark to reach the fields at dawn. Dove hunts started September 1 in Oklahoma and you need as many hunters as you could to work a field. No dogs on this one. 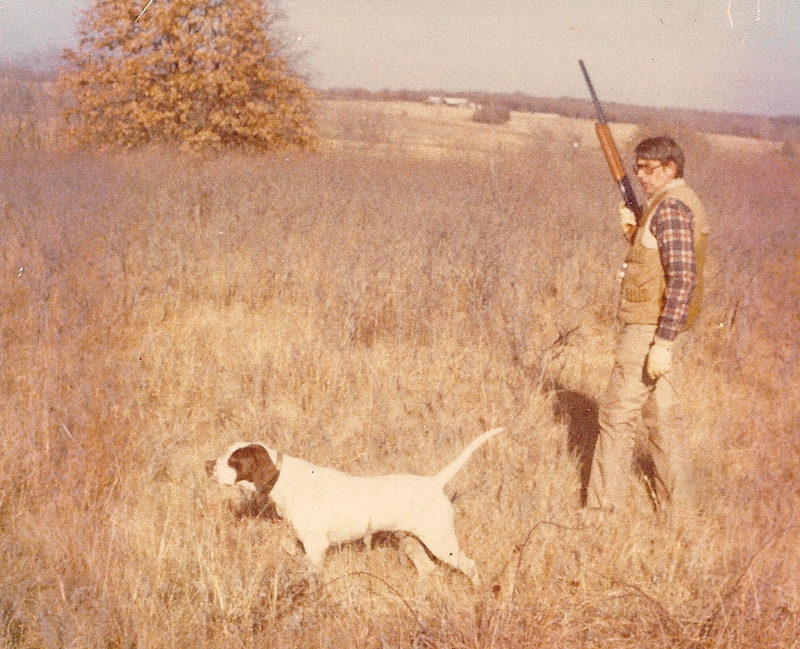 Quail hunts were smaller with as many dogs as you trusted to do the job. Walking those fields on cold fall mornings breathed life into the hunters I knew. They loved bringing home the game, but they loved being outdoors walking, working the dogs, watching the birds fly just as much. On the days when they came home almost empty handed, there was the same excitement because of the day they’d had. Another ritual was the hunters’ breakfast in small rural towns, filled with hunters coming in after the first run of the morning, telling the stories, eating the huge breakfasts provided at bargain rates in those great little cafes. It was another part of the deal. Then there was the homecoming, cleaning the birds, cleaning the gun for the next time, cleaning the mud off the boots, packing away the jackets and gear. My husband even liked to cook the game, using his Hasty-Bake in its finest way. He got a great dove recipe from someone he met in a field and we couldn’t wait. I can’t tell you how I miss having game to eat these days. Some people don’t like hunting in any form, but it was such a part of my family that I understood. They were actually some of the greatest conservationists I knew since the last thing they wanted was for a species to be over hunted. This fall, as I drive through the countryside, I study those fields and imagine the men I loved walking through them with the dogs running ahead. I understand their love of the land, of the rituals, of the season, of the hunt. I miss all of it. I miss them.